Our quick visit to Dublin wrapped up and it was time to head out for the longest portion of our trip, a week based out of Killarney. Our trusty steed was a BMW 3-Series wagon, mainly because it had an automatic transmission and enough space for our stroller and backpacks. As in most other countries, I found Hertz to offer the best deal among major companies using their United partnership discount. We were pleased that our United Explorer card included Ireland for primary insurance, which is not universal. So, about the driving… Way back when we were first dating, Ronnie and I were blessed with the opportunity to be together in Israel. We were each attending separate academic programs over winter break and then stayed on longer to meet up and travel for another two weeks. It was not the first visit for either of us and we both have family and friends scattered through the country, so we decided that renting a car was a good option. The only problem? I had fallen for a younger man! Ronnie wasn’t even 25 yet, so he couldn’t rent a car at any reasonable rate. That left me in the hot seat, driving through a torrential downpour, navigating around manic Jerusalemite drivers, and even getting so hopelessly lost that we ended up halfway across the country instead of halfway across the city once. At the end of our trip I told Ronnie that if he ever wanted us to have a car overseas again, the driving would be 100% his responsibility. And my husband, being a good man who is true to his word, has never again asked me to drive in another country. Bless him. Thus, the responsibility for driving was in Ronnie’s calm, capable hands. Obviously the biggest issue American drivers face in Ireland is the switch to the left side of the road and the right side of the car. I’m happy to report that Ronnie did a great job of adapting and the Irish people were politely patient as we sat contemplating our course at a few more complicated intersections. The greater challenge (especially from my perspective in the passenger’s seat) was figuring out the best course of action when an enormous tractor was coming straight toward us on a 1.5 lane road, with a wall of mud and trees on one side and a ditch on the other. Somehow it always worked out, but don’t ask me how. Just trust the process. Fortunately many routes now have big, open highways though they often charge a small toll. 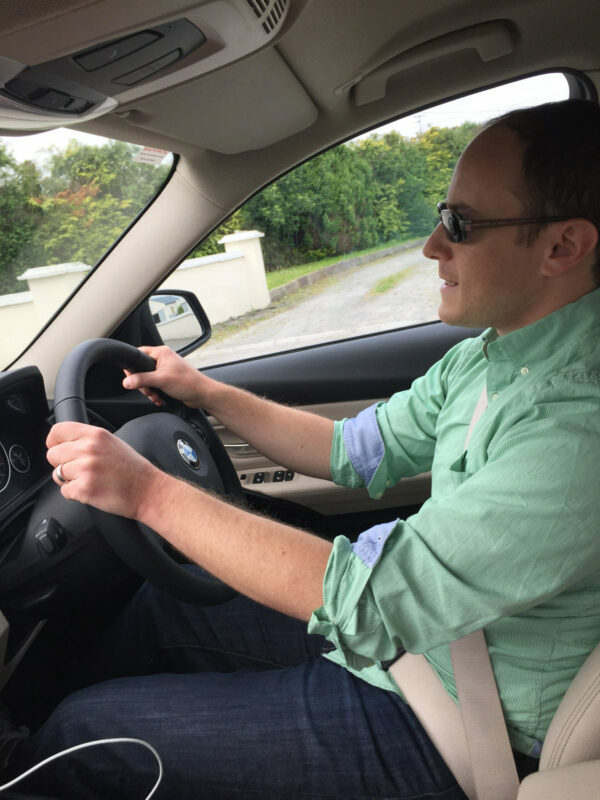 Pro tip: WAZE is great in Ireland! However, check your toll settings. Here in LA the toll roads don’t make sense for us so we set our app to avoid them. We didn’t realize that until we were probably an hour outside of Dublin and trying to figure out why we hadn’t seen any of those big, open highways but we had seen more than a few tractors on the road with us. 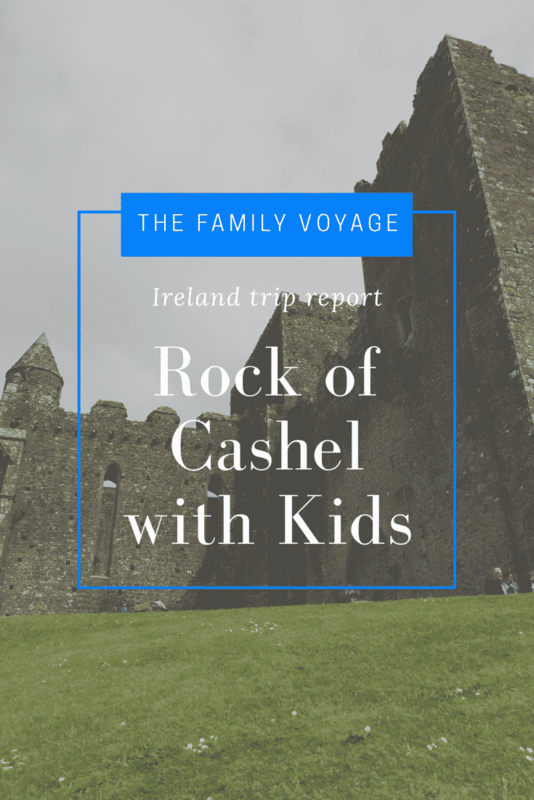 As we got into the heart of our drive, I checked the map in Rick Steves Ireland and saw that our route would put us spitting distance from one of his highly recommended sites, Rock of Cashel (Carraig Phádraig). We didn’t plan to visit I Blarney Castle, but this option sounded more interesting, less crowded and it was only a few minutes detour. As it turned out, this impromptu stop was one of our most memorable experiences! We parked in the village (check out the big municipal car park behind the Main Street!) and had lunch first. After a few minutes’ walk on flat ground, it was a decent slog up the hill (especially carrying a kid). Jacob begged to be carried, but eventually a race with Ronnie was enough to convince him to go the rest of the way up on his own. Once we got to the top, it was all worth it! At the top are the ruins of a medieval cathedral, chapel and tower plus panoramic views of pastoral land. The kids were fascinated tromping through the ruins and we had most of the place to ourselves. We’re definitely not in California anymore! We took this opportunity to teach the kids a critical life skill: how to roll down a grassy hill. Do you have any tips for driving abroad? Has your family had any awesome spur-of-the moment travel experiences? Ireland is a great road trip destination with children. We loved driving around Connemara and just stopping on the side of the ride to see cows. Epic travel. The landscape is absolutely beautiful (from the video)! And your kids are so cute. Can you talk a bit more about the Hertz and United partnership discount. Haven’t heard of this before! I LOVE Ireland! We’ve been there three times but have never driven there. Our friends got stuck in a roundabout for 20 minutes because they couldn’t figure out how to get out! I do NOT like driving in foreign countries, and give you guys a lot of credit for doing it! Awesome that you could take your kids with you as you see all these places of history and beauty. Wish I did! 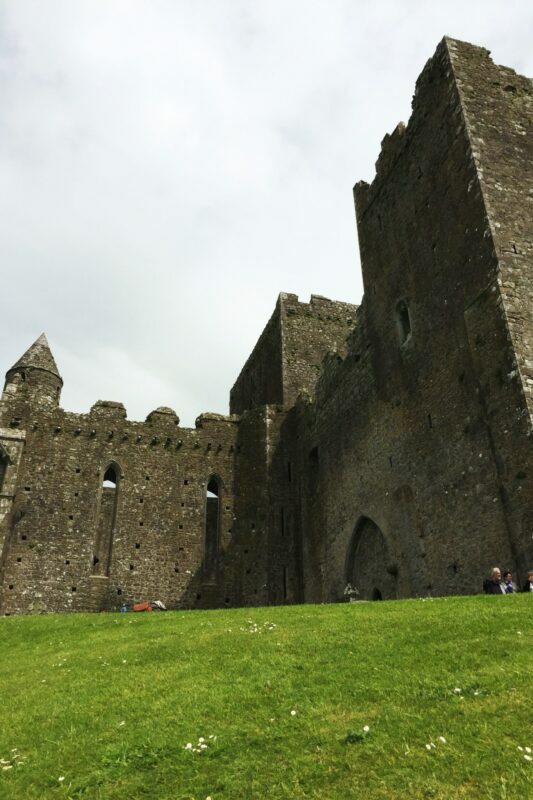 Ireland is a truly picturesque and a dream destination for me! Excellent post!